RC Radio: Stonehenge Campground & Portal, additional comments! At Stonehenge Campground you meet the energy of uncertainty. Your reality is full of known elements and unknown elements. The unknown elements can add fear and trepidation into your psyche. This feeling of uncertainty needs to be conquered and you have to learn to take a leap of faith with some aspects of your reality. Note: there is a secondary quest location, Stonehenge Portal Room, that you must complete to get all the objectives done at the Fool tarot card location. This place is located under the Stonehenge Stones. Access is via a staircase in the center of the circle (not shown). Your journey is a cooperation with you and spirit. Spirit can see the whole picture of what you are creating but you can only see the small immediate part of it. Spirit may move elements around in unexpected ways. When this happens you can do one of two things: turn around and go back, or move forward. At Stonehenge you learn about faith and trusting your vision of tomorrow and spirit’s final interpretation of that vision. 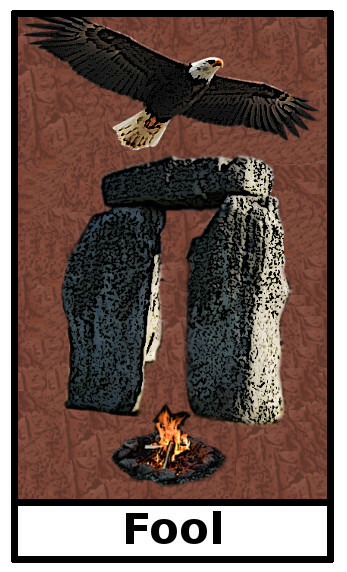 Stonehenge Campground is located between Kether and Binah in the Tree of Life. 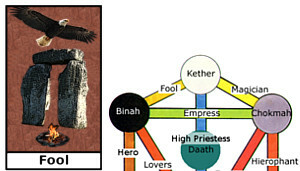 The protective, motherly energies of Binah combine with the pure spiritual energy of Kether to form this place. From the top of Stonehenge Campground you can see into the distance but you cannot make out the individual steps that will take you there. That part of your journey is not clear and you must have faith and persevere forward so that your creation will develop fully. 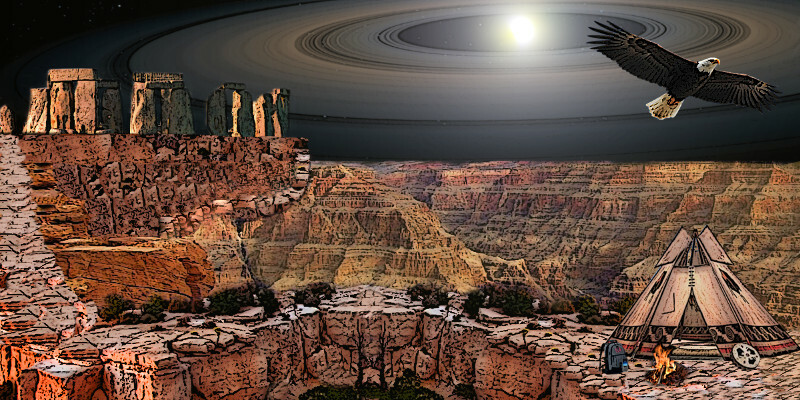 The eagle flying overhead will steer you forward when you face uncertain moments. Spirit will always be there circling, keeping watch. If you face danger spirit can bring the Knights of One (Valhalla) to your side. If you run out of reality creating strength, spirit will bring you the power of the Magician. If you lack the skill, a teacher from Hero Academy will be there to help. All along your journey up the tree of life you have made friends and gathered allies in your quest. They will be there when you need them. You are an explorer in this place and in your new life. In the Empress Garden / Empress Starship you birthed your new reality. Now it is taking form and you are meeting the challenges along the way. Some of those challenges require more thought before going forward. You can use the resources here to help you with the uncertainty. At your camp you will find your backpack filled with just the right spiritual tools you will need. Your trusty spirit-phone is here as well so that you can call for help if you need it. The camp fire from Hermit’s Cave will bring you warmth at night and keep away the darkness, fear, and the wild and untamed. The Teepee is your place of shelter and warmth. It serves as a reminder that wherever you go you have protection from the elements. The Stonehenge stone formation makes this place mystical. Gather your strength, courage, and bearings. If you are on the quest to enter Kether via the Gateways, Stonehenge Campground can point you the way. Here you will meet a Druid. This guide will help you understand the seasons of your life. It is important to know where you are in your journey, what you have accomplished and what you have left to do. The Druid Priest/Priestess you meet will council you if you need it. Note: The Stonehenge Portal Room (other fool location) is located under Stonehenge Campground. There is a staircase downward into the ground in the middle of Stonehenge Campground (not shown). Primary Gift: see Stonehenge Portal Room. Spirit-phone: to call for spiritual help. Milky White Orb filled with positive and negative energy sent out to all people over time. Take this orb to Kether City Guardian building and set the energy free so that you can create new things in your life. Down the ramp from the Monoliths opposite the tent in the camp is a Gateway to Kether, one of the three ways you can bypass the Abyss and cross into Kether.